If you’re one of those people who don’t really read all those boring warning labels on your medications because come on, you know how to take a pill (guilty), well you might want to pay attention, especially if you like grapefruit. Researchers say taking certain medications with the fruit can cause a person to overdose accidentally. It’s all due to how grapefruit stops medicines from being broken down in the intestines and the liver, say researchers in a paper published in the Canadian Medical Association Journal, cited by the BBC. At first the number of meds linked to this odd-grapefruit reaction was at around 17, but now experts say there are a whopping 43 drugs that need to be kept separate from the fruit. Researchers say the medications range from those to treat blood pressure, cancer and cholesterol-lowering statins as well as those taken to suppress the immune system after an organ transplant. It all boils down to chemicals in the grapefruit which disables the enzyme the body uses to breaks drugs down. That means more of the drug than you need goes into your body. A bit scary, to go from a regular, helpful medication to a dastardly drug in just a glass of juice, but one of the researchers says it’s no laughing matter. Researchers are worried there isn’t enough attention being paid to this problem, and advise healthcare professionas to make sure their patients are totally aware of the potential health risks. 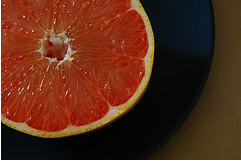 It isn’t just grapefruit, either — Seville oranges and limes can also mess up meds. When in doubt, read your drug labels and stick to swilling water with your pills.